Under the Clean Water Act Wisconsin DNR is authorized to conduct water quality management planning and to implement plans using resource management tools so that water quality is protected, maintained or restored. High quality waters are identified in the state's outstanding and exceptional resources waters list. For waters that do not meet water quality standards, the state has an impaired waters list which identifies why the water is not meeting standards and what pollutants or indicators need to be addressed to restore aquatic health. Every two years, Wisconsin submits a list of waters considered impaired to USEPA for review and approval. This list identifies which waters are considered impaired, why they are impaired, and which pollutants to address through management actions. In most cases, the pollutant is known and can be quantified through monitoring and modeling efforts. These activities are conducted when a total maximum daily load (TMDL) analysis is created. TMDL analyses are developed to quantify pollutant loads and to identify pollutant load reduction goals based on the capacity of the water to process or assimilate those loads. TMDLs are management plans that go through public hearings and which influence how point and nonpoint source activities are managed in the watershed. Alternatives to TMDLs include Environmental Accountability Projects (EAPs), where management actions are underway and the anticipated outcome is full restoration of water quality standards (without the creation of a "TMDL"). This management alternative is underway in a number of watersheds. Once waters have gone through the suite of management actions available to resource specialists at the federal, state, county, or other local government or restoratation group (or all of these), restored waters are removed from the impaired waters list. Special stories of restoration may be described on our "Featured Restorations"webpages. Managing Wisconsin Waters involves inventorying resources and condition, identifying needed actions, planning for implementation work, working with with partners to conduct needed actions, and eventually, evaluating the success of the management work. Both regulatory and non-regulatory approaches are used to manage resources, which is one of the primary objectives of the water quality program. Under state and federal law, WDNR conducts water planning and master planning for natural areas and forests, implements regulations, and secures special designations to protect, maintain or restore water resources. Designation of Wild Rivers, Wild Lakes, State Riverways, and National Scenic Riverways are special protections extended to resources that provide unsurpassed beauty, ecological value, historical and biological diversity, and cultural and scientific enrichment. The St.Croix National Scenic Riverway and the Lower Wisconsin State Riverway[exit DNR] (see also...)are examples of special waters where extra protections are in place to ensure the ecological integrity of riverine ecosystems. Regulations pertaining to aquisition and protection of resources are found in rules pertaining to the Knowles Stewardship Program. In addition, the highest quality streams and lakes of the state are identified as outstanding and exceptional resources. Conversely, those waters that do not meet minimum condition standards are identified on a list of impaired waters. Alternatives for restoring impaired waters include Environmental Accountability Projects (EAPs), which are projects where ongoing management actions are anticipated to fully restore water quality standards. This management alternative is underway in a number of watersheds and waters. Once waters have gone through the suite of management actions available to resource specialists at the federal, state, county, or other local government or restoratation group (or all of these), restored waters are removed from the impaired waters list. Special stories of restoration may be described on our "Featured Restorations" webpages. The purpose of the River Protection Grant Program is to assist local organizations and local units of government in protecting or improving rivers and natural river ecosystems. Cost sharing grant assistance is available for activities that will help to provide information on riverine ecosystems, improve river system assessment and planning, increase local understanding of the causes of river problems, and assist in implementing management activities that protect or restore river ecosystems. Water programs have focused on large rivers for many years. Early wasteload allocation work conducted in the 1970s on the Wisconsin River, where severely depressed dissolved oxygen levels from excessive biological oxygen demand resulted in the state's initial mass balance evaluations to reduce pollutant discharges based on the water's ability to assimilate the pollutant. Subsequent examples include the large-scale mass balance analyses and ecosystem restoration planning to resolve severe contamination in the state's five 'Areas of Concern' (AOCs). 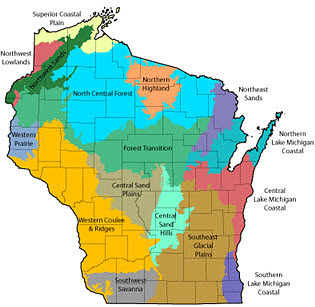 The most recent example of integrated analyses include the creation of total maximum daily load analyses and large-scale restoration planning for large river basins including: the Central Wisconsin, the St. Croix River Basin, the Fox/Wolf Basin, the Milwaukee River Basin and the Rock River Basin. Perhaps the most obvious and high-profile example of the state's Big River Management is the work conducted on the Mississippi River. The Department uses multi-disciplinary management for its riverine ecosystems. Research has identified unique landscapes defined by the land, water, abiotic elements, and biotic communities that inhabit these areas. Field teams integrate management opportunities based on ecological landscapes, which help define restoration opportunities based on the factors that inform and define these physical, biological, and ecological areas. [...Read More].